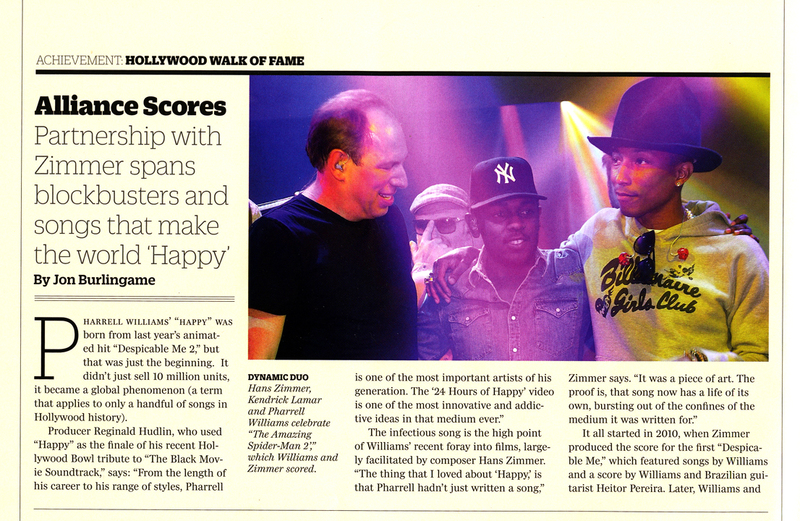 Pharrell Williams is getting a star on Hollywood’s Walk of Fame this week, so Variety asked me to consider the singer-songwriter’s already wildly successful career in film music. 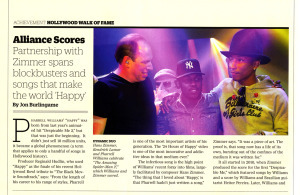 Hans Zimmer, who has been something of a mentor to the “Happy” tunesmith, offers some fascinating insights into their collaborations in this story — and Williams responds with some thoughtful and gracious comments about his film-composer friend. Along the way they talk about films like Despicable Me, Man of Steel and The Amazing Spider-Man 2. Producer Reginald Hudlin also chimes in. This entry was posted in Composers, Film Music, Interviews and tagged " Amazing Spider-Man 2, "Happy, 2012 Oscar telecast, Despicable Me, Hans Zimmer, Man of Steel, Pharrell Williams, Reginald Hudlin, Variety on December 2, 2014 by Jon Burlingame.